As a business owner, you know the importance of protecting your company. If you’re an electrician or an electrical contractor in the Edmonton region, read on to learn some things you should know and consider before purchasing electricians or contractors insurance. Electrical Installers. 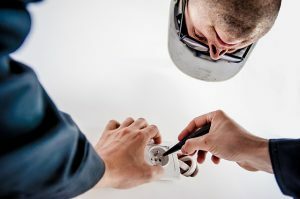 Work includes installing, maintaining, and repairing electrical wiring, equipment and fixtures while ensuring that all work complies with relevant codes. General Electrical Services. Work here may cover many areas, such as customer service, administrative work, maintenance and installation. Duties can include inspecting and replacing worn parts or systems, and completing regulatory requirements. Knowing where your electrical business falls on the scale will help ensure your broker can help get you the right protection. CLICK HERE to start a free, no-obligation electrical contractor insurance quote for commercial liability. The coverage you’ll need will vary depending on whether you work alone or employ a staff. Sole Trader. If you’re a sole trader, you’ll want to make sure you have general liability insurance. This insurance will protect your business from potential lawsuits, damages on site, and injuries sustained during a project. Most projects will require that you carry liability insurance, with $1 – $2 million coverage being the average ask. Employer. If you employ other people, you’ll need employers liability coverage in addition to your general liability coverage. Employers liability is a must as it is the company’s job to protect the safety of your employees. Employers liability ensures that in the event of an accident, your employees will be taken care of. Tools In Transit Coverage. This added coverage will protect you in the event theft from your vehicle. Losing tools can be incredibly expensive, especially if it restricts you from working until you can get a replacement. Commercial Auto Insurance. This coverage will protect your business if your company vehicle was involved in an accident. It can cover vehicle repairs, medical costs and possibly legal expenses. ARC Insurance Brokers can help set you up with the electrical insurance policy you need to properly cover your business. To learn more or get a free quote give us a call today!